Gotchyaa by Steven Stiles, D. Min. Over the last several years, many Christian authors have come out with books about living simply and helping the poor. These books on social issues have resonated with the Church. I myself have participated in a couple of studies on the subject. Inevitably, the question is raised about what about the person preying of the generosity of Christians. It comes in various forms, with people wondering if it is being a good steward of the resources if they are given to someone who squanders them. I have been going through Gotchyaa for a while. I read a chapter a week to see if it would be good to use in a group study. A few weeks after I started it, I encountered a woman in a parking lot as I left a restaurant for lunch. I make eye contact with everyone, so it isn't unusual for people to stop me to ask for assistance (it happened 4 times while I was on my Europe trip, which was funny because I was usually lost myself). She approached me, explained she was out of gas and had a 7 month old baby in the car. She didn't care if I gave her money or put gas in her car, she just needed gas. I don't usually have cash on me and as I didn't drive myself to lunch wasn't sure how I would get to the gas station. We happened to be a block or so from my church and it was also the day that we had benevolence workers available. I told her that my church could help her get a gas voucher. Before I could give her directions she was already saying she didn't know where that was as she was new in town. I explained it was within walking distance and she could cut through the parking lots to get to it. She thanked me and headed that way. I watched her for a bit, she passed a group of businessmen but didn't stop. I don't know if she went to the church or not. I don't know if it was a scam or not. I did wonder about the baby. Why wasn't the baby with her, particularly if the car wasn't nearby? After the encounter, I thought about what I had read in Gotchyaa. Now I probably wouldn't have given her money, but I still feel that I was obedient to God's command to serve the least of these. By sending her to the church, not only were people trained to help her, but she may have been able to receive more assistance that she was needing if indeed she needed assistance. While I don't think Gotchyaa would make a very good weekly study. It did provide some good information and things to watch for when dealing with people who are seeking assistance or offering deals. If a study leader is looking for scenarios for role playing, there were several good ones provided. I wasn't really sure of the role Tripp was suppose to play and often thought he wasn't really needed. Even after reading Gotchyaa, I'm still left with the question of whether I should give assistance to all who ask. If it's a con artist then they are taking resources that could have helped someone truly in need. But at the same time, maybe there is a greater purpose at work. I wonder if people hadn't fallen for the schemes of Bud and Teresa would Bud and Teresa ended up how they did in the end? So while I'm a bit more armed to spot scams (a lot of the information I already knew), my decision to assist those who ask will continue to be decided by this one question: Am I being obedient to God in my action? 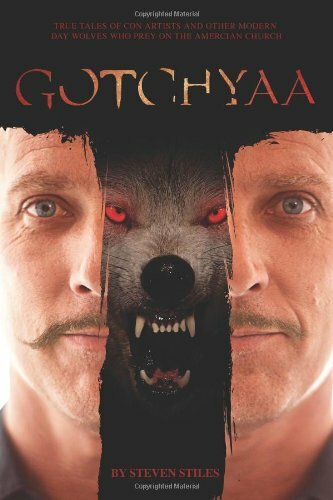 *I received a free copy of Gotchyaa in exchange for an honest review. Thought provoking Donna. A dilemma I have often faced, more so in recent years. Thanks so much for your thoughts.